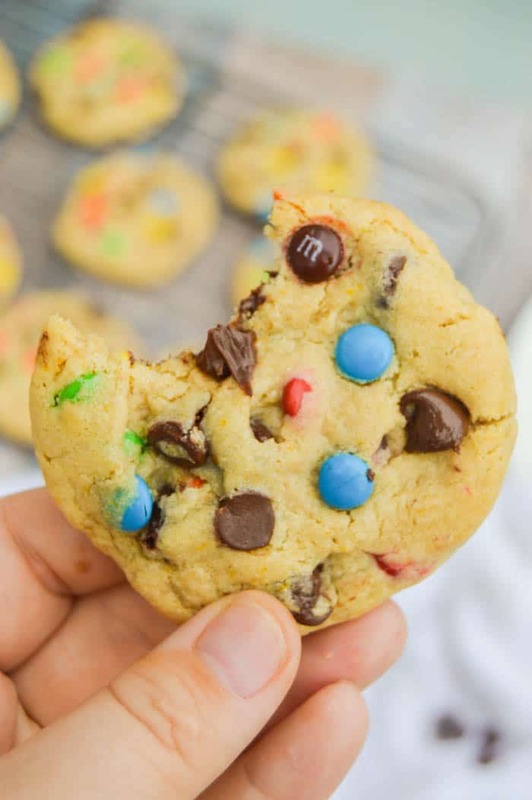 These Soft and Chewy M&M Cookies are simple to make and taste amazing. Loaded with chocolate chips and M&M candies it’s a recipe you will want to try. Cookies are my favorite dessert. Nothing is better than a warm cookie and a cold glass of milk. 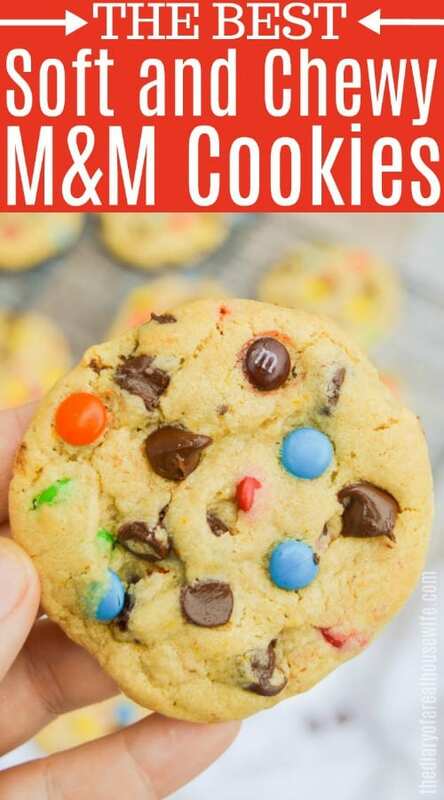 It’s the perfect treat and these Soft and Chewy M&M Cookies are one of my favorite cookie recipes. Since my boys have gotten bigger they want to stay up later at night and we have been using that time for some special family time. Usually, we will play a board game or watch a show together. They are loving top chef jr. right now and I love that they enjoy the cooking so much. Every once in a while I try to get a special treat for family night and these cookies sure do hit the spot, and the boys, of course, love them. I mean nothing beats a soft and chewy cookie. If you love cookies as much as I do then you have to check out my soft and chewy sugar cookie recipe next. Step One: Whisk together dry ingredients and then set aside. Step Two: In a stand mixer beat butter, brown sugar, sugar, egg, and vanilla extract. Step Three: Slowly mix in dry ingredients mixing until combined. Step Four: Fold in some of your M&M candies and chocolate chips. Place in the fridge to chill. Step Five: Preheat oven and prepare a baking sheet with parchment paper. Step Six: Roll out balls of dough and place them on your prepared baking sheet. Step Seven: Bake then remove from the oven and allow to cool on the pan for at least 10 minutes. Instant pudding mix: When adding the pudding mix you want to make sure you are only adding the dry mix. Do not prepare the pudding. I would suggest to not use a sugar-free pudding but just a regular instant pudding packet. Chilling time: This recipe must be chilled for at least 3 hours before baking. This cooking dough can last in the fridge for 2-3 days or can be frozen and kept for 1-2 weeks. Pretty cookie: If you want the cookie to not only taste like mine but also look like mine here is a little trick. I only fold in some of my chocolate chips and M&M candies and keep the rest for the top. I place the reaming on the top of the cookie dough before I bake them by just pressing them into the top of the cooking dough ball. Here are a few more of my favorites with M&Ms! 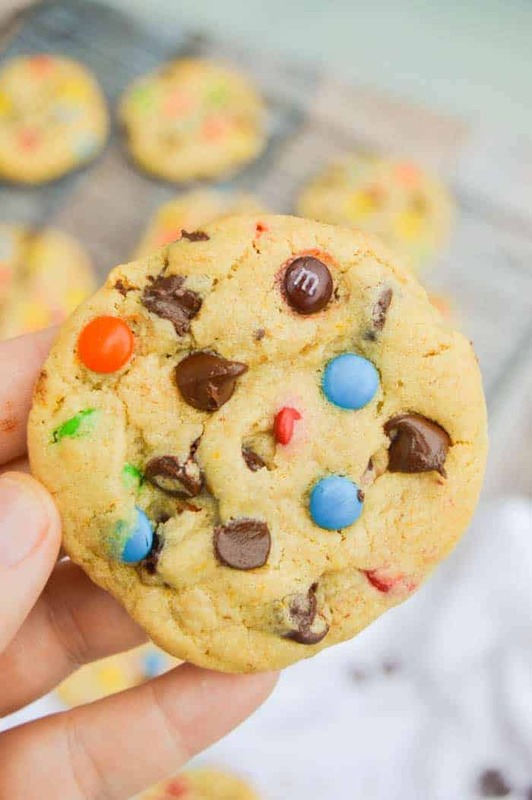 Peanut Butter M&M Cookie: I love a good peanut butter cookie. This recipe is just like the classic but loaded with M&M candies! Oatmeal M&M Cookie: Some people may give the oatmeal cookie a bad rap. But this one is one you are sure to love. Double Chocolate M&M Cookie: I mean double chocolate and loaded with M&M candies, do I really need to say more? Whisk together flour, instant pudding mix (just the dry mix), baking soda, and salt then set aside. In a large bowl with an electric mixer or in a stand mixer beat butter with brown sugar and sugar. Add in egg and vanilla extract and continue to beat until creamy and well combined. Slowly mix in dry ingredients making sure to scrape down the sides of the bowl as needed. Mix until combined then fold in 3/4 cup of M&M candies and chocolate chips. Chill for 2-3 hours. Roll out balls of dough and place them on your prepared baking sheet. 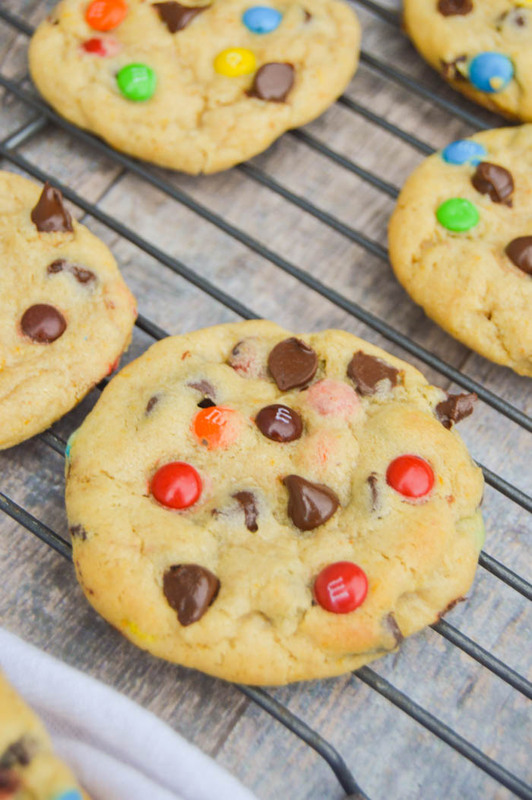 Top your cooking dough with your remaining M&M candies by pressing them into the tops of your cookies. Bake for 8-10 minutes. Remove from the oven and allow to cool on the pan for at least 10 minutes. YUM! Chewy homemade cookies are the best!!! Thanks! These are so good! I would love a couple of those cookies right now, they look so good! Thanks so much for sharing with Full Plate Thursday and have a great week. Oh yeah Angie, I could think of any reasons to make these!! These cookies need to be in my Cookie Jar, they sure look good. Hope you are having a great day and thanks so much for sharing with Full Plate Thursday.